Q. 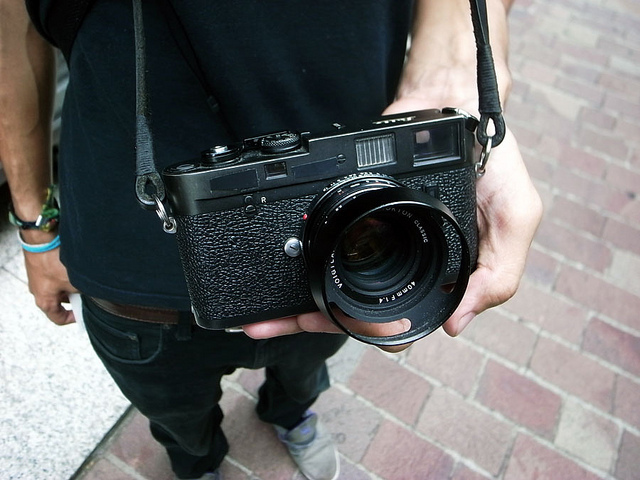 What tape is the best to cover up the logos on the black Leica M6? It’s purely for aesthetic reasons. I neither think that it will keep away robbers or make me invisible. But I just hate how the logos ruin the perfect design and how if one wants a black logo-less Leica with a light meter ones cheapest choice is an MP which is just too expensive for me right now. Sadly there are no replacement covers without logos so tape is the only solution. I could blacken the white typography and change the logo but I don’t want to lower the resell value. So which tape is the best? Electrician tape seems to have the most similar color and texture but it also leaves residue. Does it permanently damage to paint/coating? Or can it be cleaned without any damages? I heard that gaffers tape doesn’t leave residue but the texture makes it stick out too much. Any other suggestions? A. I’ve always used a black Staedtler Fiber Tip Pen – Permanent ink. It covers the white text and red dot up well, and can be removed at any time without any damage to the white paint underneath , with a bit of alcohol. A. I use “Matte Black Japanese Washi Masking Tape” and it works very well. I’ll post some pics soon. This entry was posted in Uncategorized on January 14, 2016 by Leicaphila.